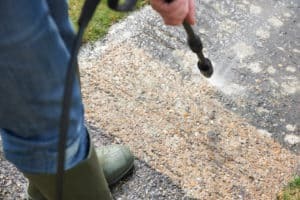 Although it might seem satisfying to pressure wash your business or home, it’ll always be better to hire a professional. The time and cost alone will make it worth your while. However, the chief concern surrounds your risk of personal injury. Did you know that a garden hose sprays water at approximately 50 pounds per square inch (psi)? A professional pressure washer can reach upwards of 4,000 psi. This can cause tremendous personal injury. A professional will be trained to prevent injury, and get the job done with the greatest efficiency and ease. Let’s dig a little deeper into each of these reasons. The high pressure from a professional pressure washer can come as quite a surprise. Imagine standing atop a 15-foot ladder in front of your business or home, turning on the spray, and being blown off the ladder. Equally disconcerting, imagine accidentally spraying your hand with the hose and lacerating your skin. Likewise, electric shock can occur if used improperly. Carbon monoxide poisoning is also a concern when operating gasoline-powered engines. Always choose to err on the side of caution and allow the professionals to take the risks they’ve been trained to avoid. With upwards of 4,000 psi hitting the siding on your business or home, it’s probably not surprising to hear it can cause serious damage to your property. An expert will know what level of pressure to use based on the material he or she is dealing with. One setting will be more appropriate for the Trex on your deck than the vinyl or cedar siding on your home. This applies to monetary cost as well as opportunity cost. By the time you rent all your equipment, as well as any supplement hoses, chemicals, or other materials, and transport them back to your business or home, you’ve already spent quite a bit of money. You’ll also be required to take time off from work or eat up an entire weekend to do something you could pay a professional to complete in, say, half a day. The overall time and cost spent on a professional, when compared to your own labor, will always be more cost-effective. Through their knowledge and efficiency, a professional will know how and when to adjust each nozzle for each hard to reach angle. Every power washer is not the same. A professional pressure washer will operate at larger angles with higher pressure. They’ll also have access to professional accessories and attachments and know when to apply them. Just like they’ll know what level pressure to use for each material, they’ll also know, for example, that when mildew is present, it’s time to use one chemical over another. Your friends at Pro Wash will eliminate any of those embarrassing streaks or discolorations that keep your home from looking its best. We’ll also help you maintain the cleanliness and safety of your commercial property. Contact us today. We’d love to help you bring back some the joy and safety that comes from a clean, well-kept business or home.